The first reading at Mass set the theme for OLMC’s 2019 Faith Day. As the students met with their Faith Families, this message of friendship and its many facets and riches was discussed, experienced and reinforced. From Fr. John David’s homily about his personal experiences with friendship all through activities led by the catechists and 8th graders, the theme of friendship with each other and with Jesus was woven throughout the day. After children attended Mass with their regular class, and after they had a snack and a little break, they met in the gym and joined their Faith Families. On this Faith Day the students were surprised to find themselves in the studio audience for Sr. Mary Josephine’s exciting radio show, 1954 AM The Mount. And Moses and Aaron even made a guest appearance! Moses and Aaron talked about their lives and all the fantastic things they experienced, but most importantly they talked about their relationship and friendship with each other and their relationship with God. Through this interview, the reading from Sirach was reinforced and presented in an engaging and memorable way. 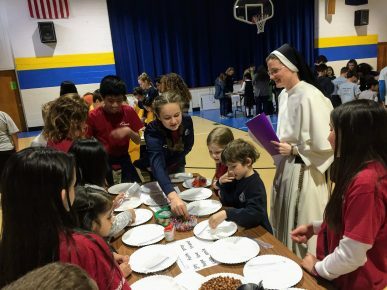 While spending time with their individual families (with a mix of students from PreK – 8) students played focused games and activities, again reinforcing the message of friendship: with each other, with strangers, and above all with God, who guides all relationships. As the faith families participated in their rotations, students spent time in reverent Adoration and had the opportunity to go to confession. We were blessed to have no less than six priests from throughout the Peninsula were on hand in rotation throughout the day to take confession. One of the day’s most tangible and memorable activities was the creation of friendship bracelets. This all school activity was capably led by OLMC’s 8th grade students. This actively illustrated Our Lady of Mount Carmel school’s pillar of service as each student created a friendship bracelet for themselves and an identical one for a person being blessed by the OLMC Outreach Center. When someone comes into the Outreach Center for a need they will be given one of these bracelets and they have the opportunity to leave a prayer request in return. 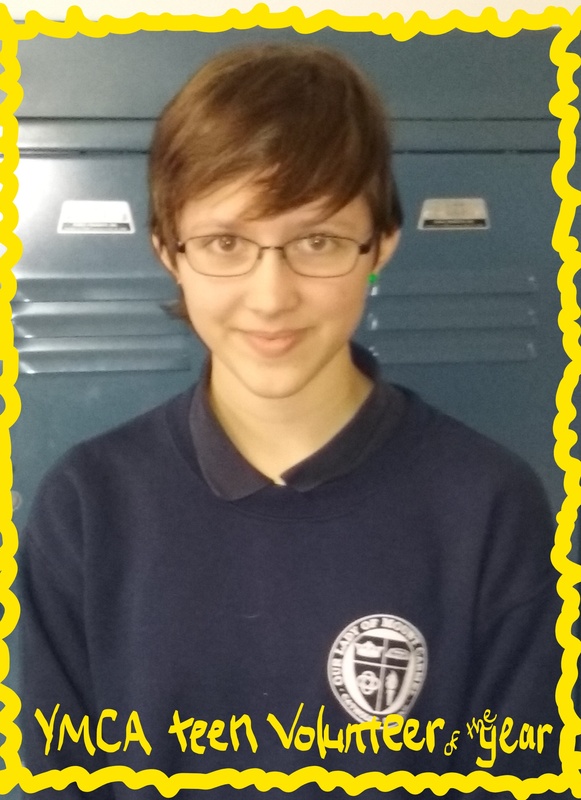 This prayer intention will then be returned to the school and the particular student who made the bracelet will pray that God blesses the recipient in his or her life as he or she wears a bracelet as a reminder to pray for their person in need. The day ended joyously with praise, worship and even dancing led by Peninsula Catholic’s High School Ministry. Peninsula Catholic’s praise and worship team was on hand all day, playing music at Mass and throughout Adoration. They added a beautiful element to the day’s event and were appreciated and enjoyed immensely by both OLMC students and staff. The Lord blessed this beautiful day. The good feelings of friendship fostered were palpable. Thank you to all of our students, catechists, staff, parents, family and friends that made this day possible and tirelessly help make Our Lady of Mt. Carmel School a place that truly fosters faith, family, and friendship. 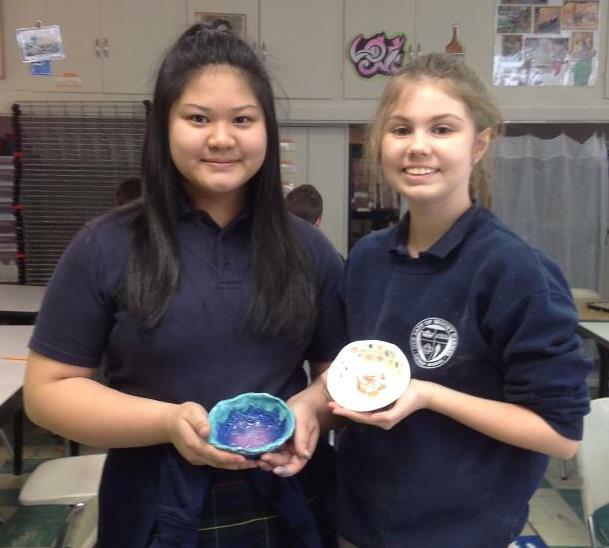 OLMC 7th and 8th grade Scripture students contributed artwork last month to the annual fundraising event for the local Empty Bowls agency. The students were inspired to help after a visit from VPEB volunteer Linda Haugh. She explained to the students that the Empty Bowl project began in Michigan in 1990, as a way to draw attention to the plight of hungry Americans. Since then, the concept has expanded across the United States, raising millions of dollars in donations for hunger-fighting agencies. The concept is simple: local artists create ceramic bowls and donate them to the annual soup and bread supper. Patrons purchase tickets in advance and attend the dinner; a simple meal is eaten and artists’ bowls are purchased to raise additional money. All proceeds from these events are used to feed the local poor. Ten of our students created lovely ceramic bowls to help fight hunger in Hampton Roads. Some used forms to hand-shape their bowls, while others used clay coiled into ropes. The students fired their bowls, applied glazing and fired them a final time. The creations were then delivered to the agency for inclusion in its annual dinner. OLMC Church’s Cub Scouts, Wolf Dens 5 and 6 partnered with the school community to host a blended service and fundraising opportunity. From Nov. 26 through Dec. 1, the school library hosted the annual Scholastic Book Fair, a pre-Christmas fundraiser. Students could participate in its “wild west” book fair theme by wearing western garb to school for a day… if they also brought a can of food to donate to the Wolves’ food drive. The parish dens chose to do the food drive to earn their Council Fire belt loop, a community service requirement for their rank. Wolf Den Leaders Jered Benoit, Jason Southworth, Scott Splinter and Jason Weischedel worked with the Scouts to plan the event, which quickly blossomed with contributions from others. Mrs. Tina Wandersee, Director of Social Ministry for OLMC Church, offered to receive the donations on behalf of local clients who benefit from the OLMC Food Pantry. Sarah Weischedel, a parent at OLMC, and her husband, Den 6 leader Jason, wanted to set up the event in a fun and meaningful way. They contacted Sr. Maria Frassati, OLMC principal, to inquire about teaming up with the school. Sister was eager to help and agreed to provide the donation incentive of wearing a western accessory to school. Mrs. Jennifer Kunz, school librarian, also offered a prize for the class with the most donated items. Our students responded enthusiastically, donning bandanas, cowboy boots, studded belts and flannel shirts as they eagerly donated 718 cans of food at the entrance to the book fair. Miss Bender’s first grade and Mr. Stephenson’s sixth grade won the competition, earning a treat and special reading time from Mrs. Kunz. The real winners, however, were the students who learned the importance of serving others. 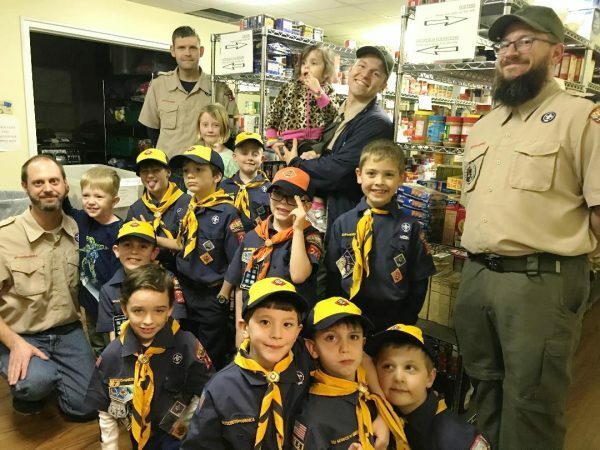 After unloading their collection at the church, Mrs. Wandersee asked the Scouts to stock the food on the shelves, an activity that turned out to be their favorite. For more information on the OLMC Cub Scouts, please contact Cubmaster Jon Sargent at jonsarg@yahoo.com or (757) 525-0077‬. Donations to the food pantry are always accepted. Please bring non-perishable food items to OLMC Church and feel free to drop them in the large bins in the Commons area. 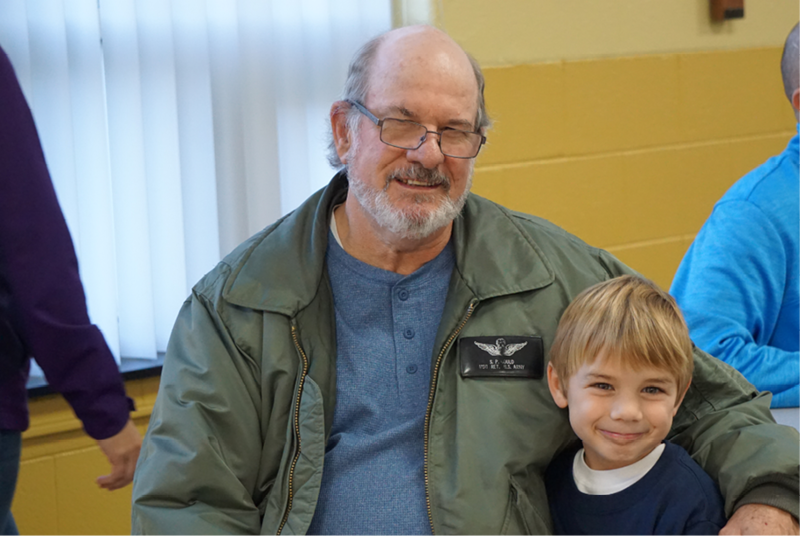 To honor our OLMC military – active duty, retired, reserve and veterans – our school hosted a special celebration for Veterans Day in November. More than 50 personnel representing all six branches of the armed forces attended our “Bring Your Service Member to School” event.